In this, my first year of teaching, I was tasked with guiding a group of students through their first ever university essay. I soon realised that I was just as anxious, if not more so in some cases, about the assessment as the students. The questions never stopped from the students or myself. Besides recognising the dangers of the rumour mill, I could see that the students were asking for an exact, essay formula to help them succeed. While I was able to dismiss the somewhat more extravagant rumours and point the students in the right direction, I found myself recanting the same advice that I heard time and time again in my first year: ‘There is no definitive answer’. Despite the pressure for me to give them the ‘correct’ answer, I instead focused on explaining that while each tutor may have a preference, it is the structure, argument and evidence that will secure them top marks. It wasn’t only the students who had lots of questions. When it came to actually marking the essays I felt myself to be in a similar position to them, as I was dealing with the unknown. Far from being an expert on the variety of topics encompassed by the module, I questioned whether I was even capable of marking these essays. How would I know what grades to give? Would I be too lenient or too harsh with my marking? Have the marking criteria set out in front of you at all times. Talk to your peers and if still in doubt don’t be afraid to talk to the module convenor. Be strict with the time you spend on each essay. I decided to group the essays into topics, which proved helpful for making comparisons. However, I still spent ages at the start poring over the essays, reading them a number of times in an attempt to understand what they had said, and what mark to give them. Some essays marks were fairly obvious, others were trickier. However, having the marking guidance set out in front of me at all times and with the key bullet points for each grade underlined, helped me work out the differences between the marks. As I read more of the essays, each being of different quality, and thought about feedback, I realised that I did have an understanding of what makes a good and bad essay. While marking schemes help to an extent, having faith in your own judgement is essential. My confidence was reinforced when I spoke to my peers, realising that we were dealing with same issues and giving the same marks. In a case where I was really struggling with one mark, I decided to go to the module convenor to discuss it. They agreed with the mark I had given and the way in which I had approached the task. This experience gave me faith in my own ability and helped me to be stricter with the time I was spending marking the essays. I have been assured that marking gets easier and quicker in time. What is certain is that in marking their first assignment the learning curve was just as big for me as it was for my students. Good, reflective advice Katie. Marking students work for the first time is an important moment for any tutor. Whilst there’s feedback to think about, the most pressing thing on one’s mind is what grade to give. I remember this well – being unsure I was marking accurately and so only giving a final mark to each essay when I’d marked them all. It made me feel a bit better in terms of my (uncertain) judgement but slowed things down quite a bit. Too often when I started I felt on my own and worried that f I confessed my fears it would make me look less capable. Thank goodness things are now better for new tutors in our subject – decent marking criteria, grade descriptors, even some training in assessment. But marking for the first time is still a trial – it’s you and the script. I have to say I’ve not encountered many historians who love marking, but we’re all conscious of how important that grade is to students. Assessment influences their whole approach to studying and sense of self-esteem, and, of course, everyone wants to do well (especially if they’ve done so in the past). And as you found out, today’s students are very strategic – shaped by A-level coaching that often specifies exactly what they should do to get the best marks down to how long the first paragraph should be! So they are often far away from our conception of what writing an essay is about. As you point out, in marking consistency is important to reliability, and having the criteria in front of you, grouping the essays into topics and asking others (peers /the module convenor) really does help. Taking a break every now and then as you mark is also important – otherwise you get tired and your sense of judgement goes awry and, the evidence suggests, you start to give more middle-range marks. Sometimes writing a quick model answer plan can help too – I often did this before marking exams in particular. If you’re marking manually, even not putting the whole pile of essays on my desk can make you feel better about the task ahead. And I would also say that it’s important to remember that these are first-year students after all – the grading criteria are often universal and don’t always take note of that but it’s useful if you do. I can confirm that marking does get easier and quicker in time. Gradually the grading criteria become second-nature and for me quickly reading the introduction and conclusion first tends to help with orientation. Then I repeat to myself my mantra: focus; structure; evidence; analysis; argument. But the borderline marks still cause the greatest pondering: is it a 59 or a 61; a 68 or a 70? There are some dilemmas that never go away. This makes for very interesting reading. I think the final comment that it becomes quicker over time holds true, but after marking millions of words over a number of years I still find myself reflecting on the process to a great extent. I don’t really think that’s a problem but actually I feel this is healthy and professional. What you describe here is that start of that process really and I think it’s essential for markers to display the kind of humility you express here. The requests from students were really striking and match my own experience. This is becoming ever more noticeable and I assume it’s a reflection of the culture of learning a template at school. One way of addressing this is to run an assessment workshop in which you can answer questions (this saves repetition) but where you can also run different tasks, such as getting students to mark previous examples of assessments. I do this by giving bullet point examples of previous work rather than the actually work so it’s a fairly quick process. I generally focus on different examples which highlight different problems, such as not discussing the evidence, being badly formatted, plagiarism, etc. Katie – your insight into the essay consultation meeting with your students is fascinating. It tells us a lot about the learning environment our students have come from – school – where teachers (for understandable reasons) often give very specific guidance, even a formula, as you suggest, for assessments. Our responsibility as tutors is to respect that environment and acknowledge the security those kinds of questions give our students, while gradually giving them the skills and confidence to look beyond the “right answers” and to think and study independently. At times it is a very tough balance to strike, as your blog suggests! 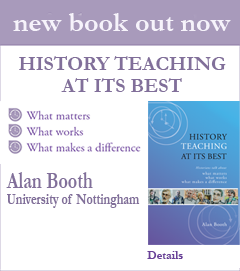 I find that making it clear to the students from the outset that there are no “right answers”, explaining that this reflects the intrinsic nature of history as a discipline, and accentuating the positives of all this – that it might empower students, develop their confidence and give them a voice rather than destroy them – helps ease this transition. Perhaps only a little though – my 3rd years are still asking these sort of questions about their gobbet analyses! In my experience, students often look for a template for essays, and you are right to emphasize the importance of their own individual response. You can go so far with what an Introduction should do etc, but the essay is after all a challenging exercise for them to demonstrate their abilities. I think marking by question is a good idea: you soon get a feel for problem posed. I also think your three points are well chosen. The criteria are useful, but as you note, in the end you have to have a gut feeling on the standard of each essay, and be confident you are right. What goes with that is not wasting time reading and re-reading essays: you may find yourself with a large number of essays to mark, and your time is precious…. Finally, there is always the odd tricky essay, and taking advice is always a good idea.